Program GPLOT is a three-dimensional geometry plotting program, for graphical representation of the calculation model. The geometry of the model are read from BODY-commands given in the CALC input data file, with extension .frespf, .modalf, .quasif, .runf or .tsimf. Description of available BODY-commands is given in this manual page. Execution of program GPLOT starts by pressing the gplot-button, or writing by the command "gplot". First argument can be a runf-file from the runf-directory. Second argument can be a gp-file from the gp-directory. Read_Runf = Read geometry from input data file *.runf, *.frespf, *.modalf, *.quasif, or '.tsimf. Read_GPdat = Read data from a GPdat-file. Print = Send current picture to printer or file. Create Video = Create a video file in wmv- and/or ogg- format. Command = Possibility to give commands to program GPLOT, is kept for backward compatibility reasons, not supported any longer. Exit = Stops the execution of program GPLOT. Show 1 diag = Show the model in one big diagram. In the popup-window which appear, the user can choose if the deformed and/or undeformed state shall be shown or not. Show 4 diags = Split the window into four smaller diagrams allowing the user to select between plotting the model or a close-up view of the wheel- and rail-profile including its track forces, contact forces, creepage and contact ellipse. Scale_xy = Change the scale factor for the geometry. View_Center = Define the point to be located in the center of the window. View_Default = Sets the View_Angle to the angles 15, 0 and 45. View_Top = Sets the View_Angle to the angles 90, 0 and 0. View_Side = Sets the View_Angle to the angles 0, 0 and 0. View_Front = Sets the View_Angle to the angles 0, 0 and 90. Draw_Deform = Selects deformation from the GPdat-file. Deform_Scale = Change the scale factor for the deformed shape. Coord_Scale = Change the scale factor for the coordinate systems. Force_Scale = Change the scale factor for the animated forces. Deform_Phase = Define the phase angle of the deformed shape. Draw_Symbols = Select if symbols shall be drawn or not. A push button that changes to the previous state. When animating results from MODAL the Prev-button will change to the previous eigen-mode. A push button that changes to the next state. When animating results from MODAL the Next-button will change to the next eigen-mode. A push button that opens the "Select Symbol" popup menu. In this menu the user can select which symbols that shall be shown. A push button that opens the "Select Forces" popup menu. In this menu the user can select which forces that shall be shown. A push button that opens the "Select Bodies" popup menu. In this menu the user can select which bodies that shall be shown. Users Manual = Opens the documentation with the web-browser defined in the environmentvariable $genhtml. Tool tips = Toggle button where the user can turn on or off tool tips. About = Creates a popup-menu showing the GPLOT program version. In the short scale the user can control the speed of the animation. Back A push button that starts backward animation. Stop A push button that stops animation. Fwd A push button that starts forward animation. In the long scale the user can manually control current picture of the animation. box_lsys = Defines a box shape body, the shape is described in coordinates of a lsys. box_mass = Defines a box shape body, the shape is described relative to the center of gravity of the mass. box_lsys_522 = Defines a box shape body with 5*2*2 number of nodes in order to show flexible modes in the body. box_mass_522 = As in BOX_LSYS_522, but the shape is described relative to the center of gravity of the mass. box_lsys_733 = Defines a box shape body with 7*3*3 number of nodes in order to show flexible modes in the body. box_mass_733 = As in BOX_LSYS_733, but the shape is described relative to the center of gravity of the mass. car_lsys_522 = Similar to BOX_LSYS_522 but end a0 of the box is shaped like a front of railway a vehicle. car_mass_522 = Similar to BOX_MASS_522 but end a0 of the box is shaped like a front of railway a vehicle. cylx_lsys = Defines a cylindrical shaped body, the shape is described in relation to a lsys. cylx_mass = Defines a cylindrical shaped body, the shape is described relative to the center of gravity of the mass. figure_lsys = Defines an arbitrary shaped body, the shape is described in coordinates of a lsys. figure_mass = Defines an arbitrary shaped body, the shape is described relative to the center of gravity of the mass. opengl_mass = Defines a geometric primitive according to OpenGL. The geometric figure is described relative to the center of gravity of the mass. 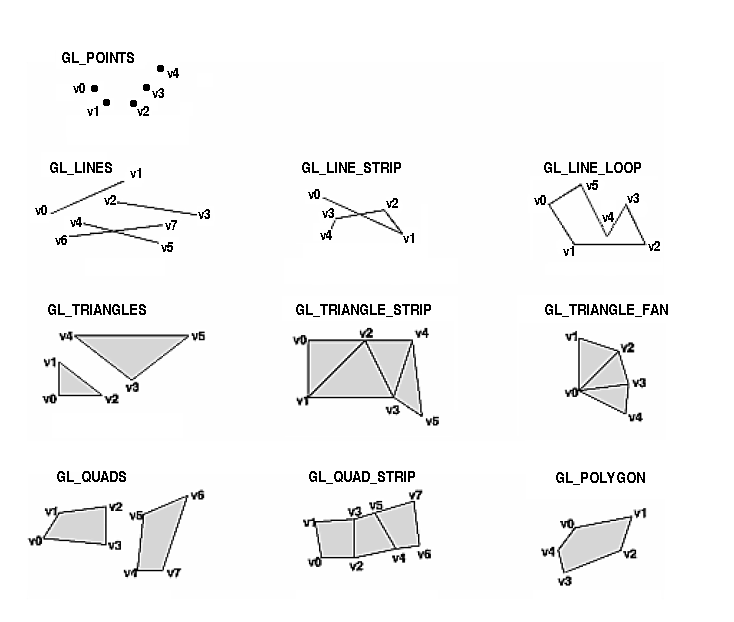 opengl2_mass = Defines geometric figures consisting of several OpenGL geometric primitives. The geometric figure is described relative to the center of gravity of the mass. whe_set_lsys = Defines a wheelset shaped body, the shape is described in coordinates of a lsys. whe_set_mass = Defines a wheelset shaped body, the shape is described relative to the center of gravity of the mass. bname = Name of the created body. NB. The name must be equal to the name of the mass stored on the GPdat-file, if plotting of the deformation shapes shall be possible. lsys = The name of the lsys-system in which the values a0,a1,b0,,, etc. should refer to. The center of gravity of the mass is the reference point in which the values a0,a1,b0,,, etc. will refer to. Box_lsys_733 is used to create a figure in box shape. The box consists of 36 nodes in total, in order to give a better shape of the flexible mode. lsys = The name of the lsys-system in which the values a11,b111,,, etc. should refer to. Box_mass_733 is used to create a figure in box shape. The box consists of 36 nodes in total, in order to give a better shape of the flexible mode. ref_point(1:3) = X-,Y- and Z- coordinates relative to lsys to the reference point in which the values radius and height refers to. The coordinate system lsys is the linear local coordinate system which the body is related to. radius = The radius of the cylinder. height = The height of the cylinder. lsys = The name of the lsys-system which defines the center of the cylinder. bname = Name of the created body. NB. The name must be equal to the name of the mass stored on the GPdat-file, if plotting of the deformation shapes shall be possible. The center of the cylinder will be equal to the center of gravity of the mass. ref_point(1:3) = X-,Y- and Z- coordinates relative to lsys to the reference point in which the values point11,point12,point21,,, etc. refers to. The coordinate system lsys is the linear local coordinate system which the body is related to. lsys = The name of the lsys-system in which the coordinates of the figure refers to. bname = Name of mass to which this figure shall be related to. Red = Portion of red color of this geometric primitive. The value of Red must be in between 0-1. Green = Portion of red color of this geometric primitive. The value of Green must be in between 0-1. Blue = Portion of red color of this geometric primitive. The value of Blue must be in between 0-1. Alpha = Transparency. The value of Alpha must be in between 0-1. Alpha=1. gives solid colors. Primitive = Define type of geometric primitive, see table and figure below. Nnodes = Number of nodes which builds up the geometric primitive. Coords = The X-, Y- and Z-coordinates for all nodes. Normals = The normal direction for the surface at the node. GL_POINTS Draws a point at each of the n vertices. GL_LINES Draws a series of unconnected line segments. Segments are drawn between v0 and v1, between v2 and v3, and so on. If n is odd, the last segment is drawn between vn-3 and vn-2, and vn-1 is ignored. GL_LINE_STRIP Draws a line segment from v0 to v1, then from v1 to v2, and so on, finally drawing the segment from vn-2 to vn-1. Thus, a total of n-1 line segments are drawn. Nothing is drawn unless n is larger than 1. There are no restrictions on the vertices describing a line strip (or a line loop); the lines can intersect arbitrarily. GL_LINE_LOOP Same as GL_LINE_STRIP, except that a final line segment is drawn from vn-1 to v0, completing a loop. GL_TRIANGLES Draws a series of triangles (three-sided polygons) using vertices v0, v1, v2, then v3, v4, v5, and so on. If n isn't an exact multiple of 3, the final one or two vertices are ignored. GL_TRIANGLE_STRIP Draws a series of triangles (three-sided polygons) using vertices v0, v1, v2, then v2, v1, v3 (note the order), then v2, v3, v4, and so on. The ordering is to ensure that the triangles are all drawn with the same orientation so that the strip can correctly form part of a surface. Preserving the orientation is important for some operations, such as culling. n must be at least 3 for anything to be drawn. GL_TRIANGLE_FAN Same as GL_TRIANGLE_STRIP, except that the vertices are v0, v1, v2, then v0, v2, v3, then v0, v3, v4, and so on. GL_QUADS Draws a series of quadrilaterals (four-sided polygons) using vertices v0, v1, v2, v3, then v4, v5, v6, v7, and so on. If n isn't a multiple of 4, the final one, two, or three vertices are ignored. GL_QUAD_STRIP Draws a series of quadrilaterals (four-sided polygons) beginning with v0, v1, v3, v2, then v2, v3, v5, v4, then v4, v5, v7, v6, and so on. n must be at least 4 before anything is drawn. If n is odd, the final vertex is ignored. GL_POLYGON Draws a polygon using the points v0, ... , vn-1 as vertices. n must be at least 3, or nothing is drawn. In addition, the polygon specified must not intersect itself and must be convex. If the vertices don't satisfy these conditions, the results are unpredictable. Defines geometric figures consisting of several OpenGL geometric primitives. The command simplifies the input data generation of common figures. The geometric figure is described relative to the center of gravity of the mass. Alpha = Transparency. The value of Alpha must be in between 0-1. Alpha=1. gives solid colors. Alpha=0. gives an invisible geometric figure. BOX Creates a box consisting of six GL_QUADS. CYL_W_DISKCreates a horizontal cylinder with two disks at both ends. Input_data = Input data to the geometric figures BOX or CYL_W_DISK, see table below. Creates a box with the following size: (X1-X0, Y1-Y0, Z1-Z0). Creates a cylinder with two disks (top and bottom). The cylinder is oriented in lateral direction. whe_set_center(1:3) = X-,Y- and Z- coordinates relative to lsys to the reference point in which the values Ro and Bo refers to. The coordinate system lsys is the linear local coordinate system which the body is related to. ro = The radius of the wheels. bo = The lateral semi-distance between the wheels. lsys = The name of the lsys-system in which the wheelset refers to. Couplings are in GPLOT called symbols. If a coupling is named with the keyword ky_guard_rail_$1r, where $2 is the number of the axle. Then also the force in the guard rail will be animated. Step by step methods for animations in GPLOT. Read the geometry of the model by clicking on File->Read_Runf in the upper menu. A popup selection window opens with all available *.runf-files listed. The files are listed according to the modification timestamp of the files. Read modal shapes from a modal analysis by clicking on File->Read_GPdat. A popup selection window opens with all available *.gp-files listed. The files are listed according to the modification timestamp of the files. Change mode of vibration by pressing the Next or Prev button in the upper menu. The speed of the animation can be changed with the scale to the left of the Fwd button. Read pictures from a time-domain simulation by clicking on File->Read_GPdat. A popup selection window opens with all available *.gp-files listed. The files are listed according to the modification timestamp of the files. Start manual animation by pressing the Next button in the upper menu. Start automatic animation by pressing the Fwd button in the lower menu. Set current picture in the animation by clicking on the long scale in the lower menu. Remember that mouse button 2 shall be used when controlling scales and scrollbars in UNIX. In order to animate track-forces, creepage, contact-forces, size of contact ellipse, shape of contact ellipse, location of contact ellipse and energy dissipation in the contact patch, select View->show_4_diags in the upper menu. Animation of wheel/rail geometry properties. From the pulldown-menu click File->Read_GPdat and read a GPdat-file created by program KPF. From the pulldown-menu click View->show_4_diags to see a close up of the wheel/rail contact. Fill in wheel number 111l in all text-fields to the left. Fill in wheel number 111r in all text-fields to the right. Check both radio-boxes Drfn for the lower diagrams. Shift the wheelset manually by sliding the scale in the lower menu. Remember that mouse button #2 works best when controlling scales and scrollbars in UNIX. Make single steps by pressing the Next–pushbutton in the upper menu. Or make a continuous motion by keeping the Next–pushbutton pressed down. Start automatic animation by pressing the Fwd or Back pushbuttons in the lower menu. See examples under directory ../tutorial .